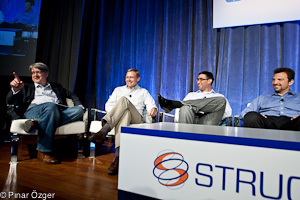 Martin Casado (third from left) at Structure 2011. Nicira, the not-so-stealthy startup working in the network virtualization space was “outed” Monday by the New York Times as a secret startup pursuing the next hot trend in computing. I like Nicira, and as someone who’s been pursuing the next hot trend in computing for more than a year, I’m glad network virtualization is finally getting some traction among the mainstream press, but let’s set a few things straight. The article, titled “What is Nicira up to?“, hits the top-secret nature of its tech a bit too hard. If you want more details, perhaps Quentin Hardy could have read our GigaOM Pro report on Network virtualizaiton (sub req’d) that heavily references Martin Casado, Nicira’s co-founder and CTO. If Hardy didn’t want to splurge for the $200 subscription to our Pro service, he could have watched Casado speak at Structure 2011 in June, or read up on this article which mentions Nicira. At least he’s profiling a company that we declared was one to watch in our Structure 50 list. The article also does a disservice to the companies pursing network virtualization by conflating the idea of flexible and programmable networks with Nicira becoming “to networking something like what VMWare was to computer servers.” This is a nice trick for the lay audience, but unlike server virtualization, which VMware did pioneer and then control, network virtualization currently has a variety of vendors pushing solutions that range from being tied to the hardware layer (hello, Juniper and Xsigo) to the software (Embrane and Nicira). In addition to there being multiple companies pushing their own standards, there’s an open source effort to set the building blocks and standards in place to create virtualized networks. The Open Networking Foundation was formed in March to build a consortium of users around OpenFlow, a protocol that separates the brains of the networking infrastructure from the switches that move the packets around. This separation makes it easier to create easily programmable networks that can be composed of commodity switches and servers. This could lower the cost of networking gear, but the end result is far more compelling because it makes networking more flexible, resilient and can offer new services entirely. So like VMware’s (s vmw) introduction of server virtualization paved the way for cloud computing, the drive for programmable networks and network virtualization will create entirely different ways of linking data centers and building networks. Nicira’s software switch may become the primary way of creating shared and flexible network resources, but it’s far more likely we’ll see a range of companies emerge to virtualize the network and then capitalize on the virtualization with new services. In the next few days, network engineers and researchers will gather at Stanford for the first Open Networking Summit where we’ll learn even more. could the author enlighten the audience about how Juniper and Xsigo are doing anything for hardware based network virtualization? Full disclosure: I am a Juniper employee, so we are an event participant. But I figured if you wanted to start to see how the HW vendors in this space view a technology that changes how the network is monetized, you might want to attend the event yourself.